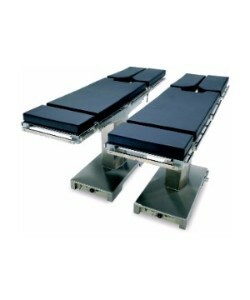 Designed to accommodate surgical procedures in nearly all fields, including urology, neurology, orthopedics, and cardiology, the Nuvo V800 series surgical tables set new standards for versatility, innovative features and solid dependability. With design and engineering thought through to a remarkable degree, they provide such benefits as unprecedented C-arm access, self-diagnosis with Instant Error Code display, and a control system that automatically prevents of sectional conflicts. 180° open to the left and right.